The Western Regional Representative of the Council of State, Mrs. Eunice Jackline Buah Asamoh-Hinneh has opined that President Akufo-Addo is a listening Head of State. She made the above utterance during her first familiarisation tour since her election as a member of the Council of State by the Region to offer advice to President Akufo-Addo. The tour sought to identify problems confronting the people of the Region and advice the President on how to find amicable solutions to the problems. Some of the areas she visited were; Prestea Huni-Valley Municipality, Amenfi West Municipality, Wassa Akropong, Tarkwa-Nsuaem, Aowin Municipality, Nzema East Municipality, Ellembelle District, Jomoro Municipality, and the four Municipal, Metropolitan and District Assemblies in the Sekondi-Takoradi as first phase. The tour also gave her opportunity to interact with Chiefs, Assembly members, civil servants, farmers and fishermen, youth groups, religious leaders, the media among others. 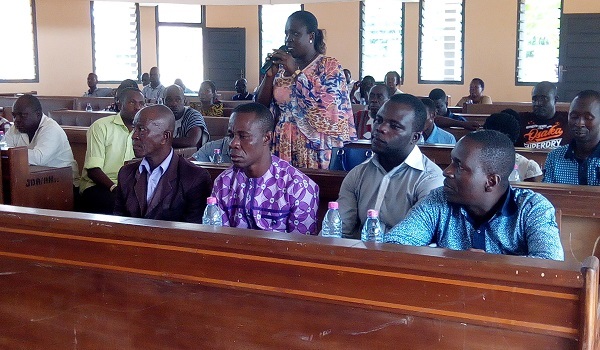 Speaking at a mini durbar held at Half Assini in the Jomoro Municipality over the weekend, Mrs. Eunice Buah thanked the Assembly members for electing her to represent the Region as a Council of State member. She also thanked the Region for reposing confidence in her as a Council of State member since she was elected to representing them. She used the occasion to bring a warm greeting from President Akufo-Addo and the Council to the people. He also congratulated her on her election as a Western Regional Representative of Council of State and pledged that the Assembly is solidly behind her. "Hon. Member, since this is your first official visit to the Municipality after your election as the Council of State Member, let me seize the opportunity on behalf of the Assembly to congratulate you on your election to serve as a member of the Council of State. We pledge our support to you for a successful tenure in office", he said. He added, "Ladies and Gentlemen, there is no denying of the fact that the Western Regional Member of Council of State's visit today is to afford her opportunity to familiarize herself with current issues of national concern and other development needs of the nation so as to ensure that these issues are addressed". 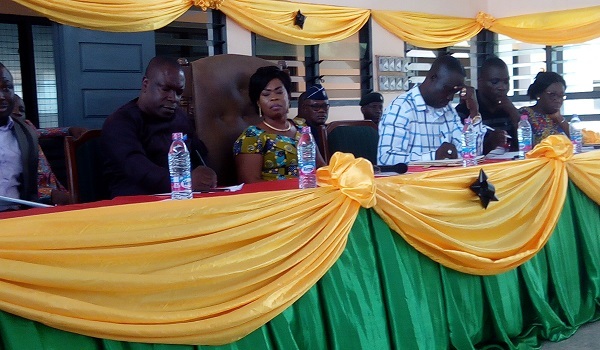 He used the opportunity to reveal to the Council of State Member that the Jomoro Municipal Assembly has had its share of the national cake under the NPP government in terms of programs and projects. He said, "The School Feeding Programmes has been expanded to include nine (9) more schools, Thirty (30) new communities have been prepared to be included in the LEAP, Work is on-going on Elubo and Half Assini Township roads". But according to him, the Municipality is facing a number of challenges and said prominent among the challenges are unemployment, poor road infrastructure, inadequate health facilities, and inadequate infrastructure for Senior High Schools within the Municipality. The MCE used the opportunity to appeal to the Council of State Member to help the Assembly to execute some key projects of the area. 8. Provision of dormitories for Half Assini and Annor Adjaye Senior High Schools. He said the elevation of the Jomoro District to a Municipal status by President Akufo-Addo this year, placed higher responsibility on the Assembly to provide the needed infrastructure to match their new status. He, therefore, called on other institutions to partner with the Assembly to create employment opportunities and provide needed infrastructure and services for its people. Reacting to some of the concerns and requests made by the MCE, Mrs. Eunice Buah promised to send their requests to President Akufo-Addo to address them quickly. She reaffirmed President Akufo-Addo's pledge to build a fertiliser plant in the area and promised to liaise with the President to put up the plant. She, therefore, urged them to be patient with President Akufo-Addo as he was putting things in order to fulfill his promises. He revealed that President Akufo-Addo has Western Region at his heart and would do everything possible to improve their living standards. Mrs. Buah said President Akufo-Addo is a listening President and therefore demonstrated to the Council that indeed he is a listening president and added she was very optimistic that President Akufo-Addo would be taken their requests into consideration. "We need you to be patient and pray hard for the government because President Akufo-Addo has the vision to effectively rule the country and move the country forward. The beginning is difficult but with patience all will be accomplished", she pleaded. She urged them to remain in unity and avoid partisan politics and rally behind the government for development. "I'm appealing with you to put your political colours aside and support to the government to develop this area", she added. 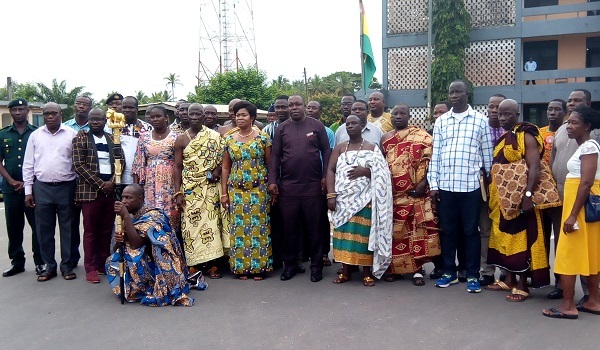 The Chief of Half Assini who was the chairman of the occasion, Nana Ayebie Amihere VI expressed his profound gratitude to the Council of State member for visiting the area for the first time as a Western Regional Council of State representative. He urged her to remember Western Region and for that matter Jomoro Municipality always and fight for more developments for the area. He revealed that if President Akufo-Addo is able to build the much awaited fertiliser plant for the Municipality, the people of the area would forever remember him. "Jomoro will forever remember President Akufo-Addo if he is able to establish the fertilizer plant here in the Assembly", he emphasized. Speaking to GhanaWeb's Western Regional Correspondent after the gathering, the NPP Western Regional Chairman who accompanied the Council of State member, Mr. Francis Ndede Siah said the Regional Executives of the party will liase with her and lobby for more developments for the Region. He said the Region is blessed with so many rich natural resources but said the Region is therefore less developed and also therefore called on the people to rally behind President Akufo-Addo to develop the Region. 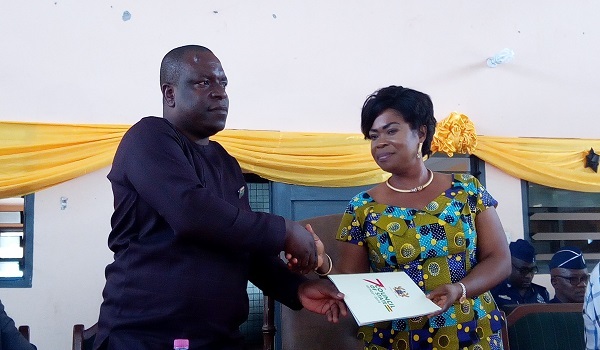 The Western Regional Council of State Member, Mrs. Eunice Buah presented a hard copy of the Council of State's annual report given to President Akufo-Addo last two weeks to the MCE to study and later on brief the Assembly about it. The Council of State member was accompanied by staff of the Council, the Deputy Western Regional Minister, NPP Western Regional Executives led by the Chairman of the party, the media among others.